A couple of years ago I wrote here about how keeping a journal of positive things in our lives can make those of us who have diabetes happier. But writing down the worst things that we experience might help even more. When we get a diagnosis that we have diabetes, it can be one of our most traumatic experiences. No wonder then that so many of us either go into denial that it's anything of importance or otherwise panic at the thought of it. But even before I learned the science behind these assertions I have been journaling about my worst experiences. Maybe it's because I am a writer and have a lot of curiosity, and writing comes naturally to me. In any case, when a doctor told me 21 years ago that my A1C was 14.4 and that I had diabetes, I started to investigate all I could find out about this affliction and began to write about it as soon as I had anything to share. For much of my life I have kept a diary. But it wasn't until I read something by Thich Nhat Hanh that I consciously started to note the good things that happen to me. He is an 88-year-old Vietnamese Zen Buddhist monk, teacher, author, poet, and peace activist who suffered a severe brain hemorrhage in November. He wrote in one of his books that a good practice at the end of each day was to write down three good things that had happened. I started by reflecting on the day as I went to bed each night, and couple of weeks later I started to write down my good experiences. Now that I follow this advice I am continually watering these seeds of joy and gratitude by focusing on all the great surprises that come my way. Some of them are kindnesses that others show me, but I also get great pleasure from the little things that I do for them. Sometimes it's just a positive email or letter. Sometimes it's beauty that I see. Sometimes it's the chance of solitude in nature, and at other times it's meeting old friends. Your experience may vary. What I write in my journal isn't polished because it's just for my eyes and memory. I call this my happiness diary. 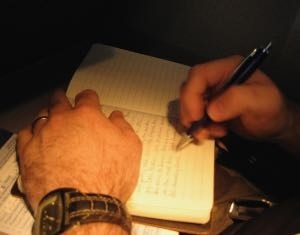 This is writing that you generally don't share with anyone else, just like in a diary or journal or day book. It is raw. It pays no heed to spelling, grammar, or sentence structure. The only rule is to express what is on your mind and in your heart. James W. Pennebaker published the first research on expressive writing in 1986 and has followed up with at least 10 more studies. The pioneer of writing therapy, he has researched the link between language and recovering from trauma and chairs of the Department of Psychology at the University of Texas at Austin. Not surprisingly, the immediate impact of expressive writing is usually a short-term increase in distress, negative mood, and physical symptoms, and a decrease in positive mood compared with people who are the controls for the studies. But in the longer term, when the researchers follwup up with the people who participate in the studies, they find evidence of health benefits. They can objectively measure these benefits in terms of the assessed outcomes, self-reported physical health outcomes, and self-reported emotional health outcomes. For example, in Dr. Pennebaker's first study on expressive writing, university students wrote for 15 minutes on four consecutive days about "the most traumatic or upsetting experiences" of their entire lives, while the controls wrote about superficial topics (such as their room or their shoes). The participants who wrote about their deepest thoughts and feelings reported four months later that they had significant benefits in both objectively assessed and self-reported physical health. They also had less frequent visits to the university's health center and fewer sick days. Since that study, other researchers have found that people who record their deepest feelings in their diary or journal say that they have much less distress, are less depressed, and in general have a better mood. They even report that they act differently with other people. Surprisingly, expressive writing even benefits us physically. I haven't seen any research yet that it will cure diabetes or even push it into remission, but studies have demonstrated that journaling improves immune system functions. People have fewer overall illness-related visits to the hospital, and when they do have to go to a hospital it's not as long. Other studies show that liver function, lung function, and blood pressure similarly improve. Intuitively, I have felt -- and recommended here -- that sharing our pain with others helps us to manage it. That is certainly one reason why so many of us benefit from diabetes support groups. It's not just the knowledge of how to handle our diabetes that helps us but even more the recognition that we are not alone with an elephant in the room like a sentence of diabetes. But for many of us the trauma of getting diabetes and having to live with it isn't something that we can share. Since on the Internet we can be anonymous, that's one of the great advantages of forums like these. But perhaps it is only through expressing your deepest and most hidden thoughts about the trauma of diabetes in writing that will help many of us toward acceptance of this life sentence that we call diabetes.